Bandit Queens Tribal Cafe: What is it? We have a monthly showcase, the Bandit Queens Tribal Cafe, in Richmond, VA, AND a project-based ensemble by the same name…the Bandit Queens! 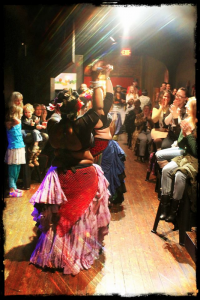 The Bandit Queens Tribal Cafe is Richmond, VA’s own monthly, family-friendly, affordably priced, professional bellydance show. The show presents a high caliber of performance in a relaxed, Sunday evening setting. Brought to you every month by your own Madame Onça, the Hardest Working Woman in Show Business, this blend of community and artistry brings food, family and fun together. Join us on the second Sunday of every month! All of the Details: Where, when and cost. NEW & IMPROVED Tribal Cafe EVERYTHING! It’s BRUNCH! New venue, new time, new date! Join us at 11:30am on June 22nd at the Camel in Richmond. Special guest artists, Shaheen Alikhan, Alyssum Pohl and Secret Richmond Guest Star, Lauren Brown! $8 advance sales, $10 at the door, $3 kids under 12. Tips are shared amongst the artists, and very appreciated. Bandit Queens presents professional bellydancers from around the nation, both traditional and experimental, in a relaxed, uplifting atmosphere! Each Tribal Cafe begins with a 15 minute dance class for the kids, donated by one of the artists performing. There is Open Dance Floor time during Intermission. Bandit Queens Ensemble: What is it? In the epic three-way battle between Beauty, Danger & Bad Decisions, who will win? The Bandit Queens are a seriously capable dance and music project, fronted by the ‘Lucille Ball of Bellydance’, notorious performer and instructor Madame Onça. These artists have entertained enthusiastic mobs across the New World, creating a rapscallion’s mix of acrobatic bellydance, burlesque, acoustic anthems, sword-dancing, saloon-tinged comedy, audience interaction, fire-eating, and family-friendly sideshow antics. Like the once and future King, when the world needs them, the Bandit Queens are there. Follow us on the Tribal Cafe page on Facebook to stay up to date with current performers, locations and fun. Find us on FaceBook and get tickets here.